Several hours before (or up to a day or two before) you’ll be serving the punch, put the water, sugar, cinnamon sticks, and cloves into a saucepan and bring to a boil. Remove cinnamon sticks and cloves and strain into a glass or plastic container. Store in refrigerator for at least 2-3 hours (or overnight) until well-chilled. 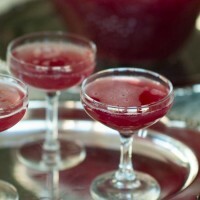 Chill the cranberry juice, pineapple juice, and Champagne in your refrigerator until ready to serve. Pour simple syrup, cranberry juice, pineapple juice, and Grand Marnier* into a large (1 gallon) punch bowl. Add an ice ring or a few large ice cubes. Using a ladle, fill glasses 1/2 full with punch, then top with Champagne. To serve this punch to drinkers and non-drinkers alike, omit the Grand Marnier from the punch bowl. Substitute sparkling cider for Champagne for the non-drinkers, and for your imbibers, add 1 1/2 teaspoons Grand Marnier to their glasses before topping with punch and Champagne. This punch is best served without adding ice to your guest’s glasses so use the largest pieces of ice you can find, or use a Bundt pan to make an ice ring for your punch bowl. Best of all, this punch is great with “bargain brand” Champagne. * Note: Total time for this recipe includes at least 3 hours for chilling the ingredients. If you can make the simple syrup the night before your party, you’ll only need 5-10 minutes of setup time before your party starts.